Luis García has signed a three-year contract to coach Getafe, replacing Míchel who was fired after last season’s 16th place finish in La Liga. Garcia is one of the rising stars in Spanish coaching circles after winning promotion to the top division with Levante in 2009/10, and then securing his side’s survival in the last game of the following campaign. 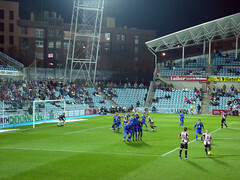 Levante finished 14th, two places above Getafe, who in turn were just a point clear of RC Deportivo La Coruña in the final relegation slot.